Switzerland conquered the first victory and earned the three points. England suffered the first break of Suisse but they returned to the game at the middle of the match for a partial 4-3. In last minutes, England tried to reduce the gap but two blue cards in few seconds, has permitted to the Simons’ team to win for 6 to 3. 3 Goals for Althaus. Tomorrow the same match for the final 5th/6th place. Germany tried to surprise the italians in first 10 minutes with 2 goals of Ober. But the answer of Italy has arrived in 2 minutes, the time for taking the draw 2-2. Italians grew up and after the first period scored other 2 goals for total 4-2. In second period Italy has controlled the game: another victory for other three points for reaching the gold medal final as in 2016. Germany has conquered again a final of 3-4 place after 6 years. 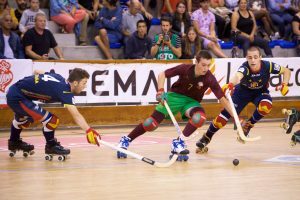 Spain won for 2-5 the last game of the qualification and has taken the first position with 15 points. Unbeatean the spanish team, also ahead an incredibile Pavilhao Monserrate, with 1500 spectators. After the first of Portugal after few seconds, Spain scored third goals in a row from minute 6 to minute 11 with Joseph, Ricart and Manrubia. Joao Lima at 16 minute reduced the gap for 4-2 of first 25 minutes. In the second half, Portugal has tried to return in the match but they failed many chance to score the draw. In the last 10 minutes Spain score the fifth goal and the team of Macia returned to the final after 4 years. Portugal will play the final for the bronze medal against Germany at 19.00 h.
Compagno (Italy) 12 goals, Santos (Portugal) 10 goals, Manrubia and Joseph (Spain) 10 goals. Spain and Italy in the top of the standing with 9 points. Tomorrow the direct match for 1st position.